Home » » Man in suit! Man in suit! Man in suit! Man in suit! 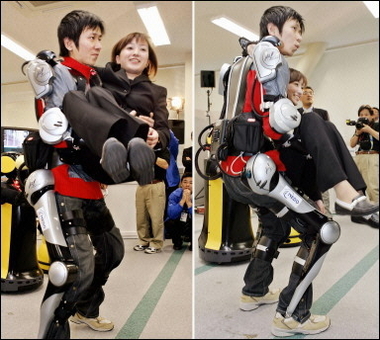 TOKYO (AFP) - Japan has taken a step into the science-fiction world with the release of a "robot suit" that can help workers lift heavy loads or assist people with disabilities climb stairs. It can also move on its own accord, enabling it to help elderly or handicapped people walk, developers said. That's gonna be a pretty cool thing for pro wrestlers to wear.